Another day, another hike. Today the map was stabbed a little further east up highway 39 instead of in the veritable backyard. There, one can find the West Fork National Scenic Bikeway, an old road still kept paved to a single lane for traffic to the dam, but locked to keep out general traffic. This route is indeed scenic, if you get off the road and into the trees. That's where this little tributary was spotted. Ravi and myself decided to hike out at Henninger Flats for the day, but we were balked by the rather high and rather locked fence. It claimed there were "dangerous conditions", one can only assume it meant the rather obvious massive land slide occurring just the other side of the river from the rather high and rather locked fence. People where down there, so there must be a way in, but it didn't look all that attractive so we didn't look that hard. Instead, we went over to Millard Canyon. 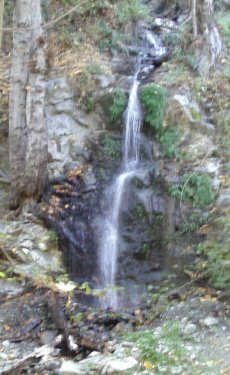 For this hike, you can start at a campground maybe a quarter of a mile from the Falls or you can start high up the canyon on a fire road a little more than a mile from the falls. We climbed down from the fire road, which was a pleasant hike, well kept since all the switchback cutters aren't hiking it. The poison oak was out in patches, turning red with the fall. This trail put us at the entrance to Millard campground, which looked like a nice place to stay there next to the stream. Following to the end of the campground, the trail continued up the canyon. 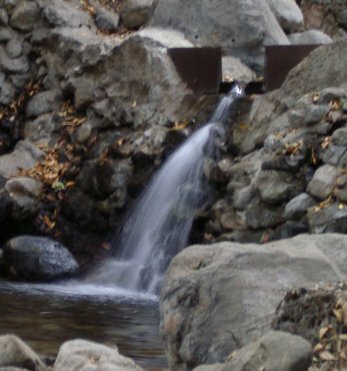 It starts off with a little man made fall over a flood control dam.